Currently shipping to the US & Canada Please place your seed orders on our pages as Heirloom-Organics cannot track clicks from our site to theirs. Alfalfa sprouts have a light, crunchy taste and are loaded with nutrients, including calcium, magnesium, iron, potassium, zinc and Vitamins A, B, C, E and K. Perhaps the most versatile of all sprouts, they are perfect in salads, sandwiches and many other types of raw creations. 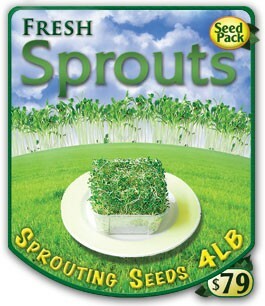 Seeds will produce a good quantity of delicious sprouts in approximately 5-6 days with regular care. Red Clover sprouts have a mild and slightly sweet taste, and will provide a nutritious complement to any raw dish. Containing Vitamins A, B, C, E and K, in addition to calcium, magnesium, potassium, iron and a host of other trace minerals, they are also rich in protein, containing more than 25% by weight. Quick to germinate, Red Clover will produce edible sprouts in as little as 5 days with proper moisture and care.